ALUMINUM CURTAIN WALL 2-1/2” Thermally-Improved Curtain Wall (available in 5”, 6”, 7-3/8”, 9” and 10-1/2” depths) The D8 Aluminum TI8590 Series is a high- Aluminum system Sleek profile, long-lasting strength and durability Blast rated Engineered to meet DOD/GSA blast criteria rated systems. Hurricane rated Engineered to meet ASTM 1886/ASTM 1996 The various depths of this 2-1/2” wide system Accommodates span and design requirements Custom cover cap styles and sizes Accommodates design aesthetics Integral sunshade options Interior climate control May be reinforced with steel Accommodates tall spans Structural silicone glazing (SSG) and standard vinyl weather seal configurations Design flexibility Shear block construction Allows for shop fabrication and efficient field assembly Custom painted and anodized finishes Wide variety of finishes to accommodate design specifications and customer needs performance pressure plate curtain wall system that delivers low U-values while maintaining the superior structural properties associated with curtain wall. This system is engineered to meet DOD/GSA blast criteria and ASTM criteria for hurricane- enables the TI8590 to easily adapt to projectspecific design requirements. It is designed to span multiple floors and take into consideration design requirements such as: thermal expansion and contraction; building sway and movement; water diversion; and thermal efficiency for cost-effective heating, cooling and lighting. 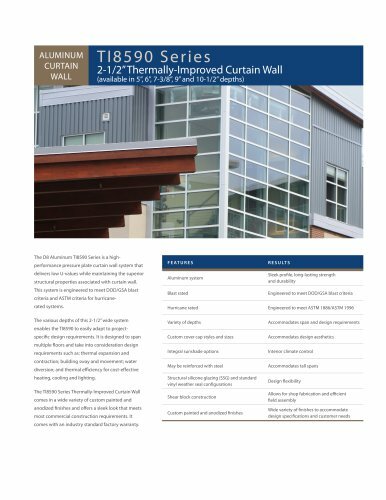 The TI8590 Series Thermally-Improved Curtain Wall comes in a wide variety of custom painted and anodized finishes and offers a sleek look that meets most commercial construction requirements. It comes with an industry standard factory warranty.